HONOLULU, Oct. 30, 2018 /PRNewswire/ -- Matson, Inc. (NYSE: MATX), a leading U.S. carrier in the Pacific, has launched its new direct U.S. flag service between Honolulu and the Republic of the Marshall Islands ("RMI"), reducing cargo transit times to the RMI from the U.S. mainland by as many as eight days. The new service will call at three ports in the RMI - Kwajalein, Ebeye and Majuro every 17 days. Matson has served the RMI since 1972. 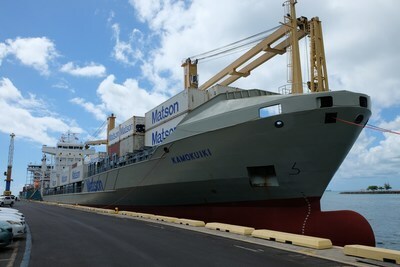 It currently serves Kwajalein, Ebeye and Majuro from the U.S. West Coast via Guam, where westbound containerized and bulk cargo is transshipped to Matson'sMicronesia service. The new service from the U.S. West Coast to Kwajalein, Ebeye and Majuro via Honolulu will deliver cargo with a transit time of approximately two weeks, compared to three weeks or more with the current service. Founded in 1882, Matson is a leading provider of ocean transportation and logistics services. Matson provides a vital lifeline to the domestic non-contiguous economies of Hawaii, Alaska, and Guam, and to other island economies in Micronesia. Matson also operates a premium, expedited service from China to Southern California and provides services to Okinawa, Japan and various islands in the South Pacific. The Company's fleet of owned and chartered vessels includes containerships, combination container and roll-on/roll-off ships and custom-designed barges. Matson Logistics, established in 1987, extends the geographic reach of Matson's transportation network throughout the continental U.S. Its integrated, asset-light logistics services include rail intermodal, highway brokerage, warehousing, freight consolidation, Asia supply chain services, and forwarding to Alaska. Additional information about the Company is available at www.matson.com.